Resort-style living, 24/7 nursing staff, and the safety and security you need to move about independently and care-free. Health means wellness in body, mind, and spirit; Danbury connects all three so you can live a vibrant life. Your home, your space, and your freedom, to live the life you want to live. Our Mission: Enhancing lives through serving others by creating vibrant, caring, and exceptional communities. Why wait until you need to make a change when you could begin enjoying the freedom, social life, security, and comfort of Danbury Senior Living now? Danbury Senior Living provides high-quality amenities and services for every stage of senior life so that our residents can live fully. Each of Danbury’s facilities across Northeast and North Central Ohio promises quality, vitality, and flexibility to its residents. At Danbury, you’ll never lack for something to do. Engage in a regular routine of healthy diet, exercise, and social time to extend both quality and quantity of life. Our staff are here to help make sure what you’ve been prescribed to keep you healthy is being administered appropriately so you can rest assured your health needs are managed. Unlike other assisted living facilities, Danbury does not require an entrance or community fee - and there are no contracts. If for some reason you decide to relocate to another facility, you have the full freedom to choose what’s best for you. When you move to Danbury, you aren’t settling into a temporary holding space - you are moving into a new home, and home should feel like home. Bring the things that are important to you, including your pets, your furniture, your books and your plants. When you come to Danbury, you come home. As a full-service senior living facility, there will never be a need to move from one place to another - as your needs change, Danbury provides individualized care for your health. Dorothy may have claimed there’s “No Place Like Home,” but when you choose Danbury, Danbury becomes home. While each of our communities delivers the same level of quality and professionalism, they each have their own personality. 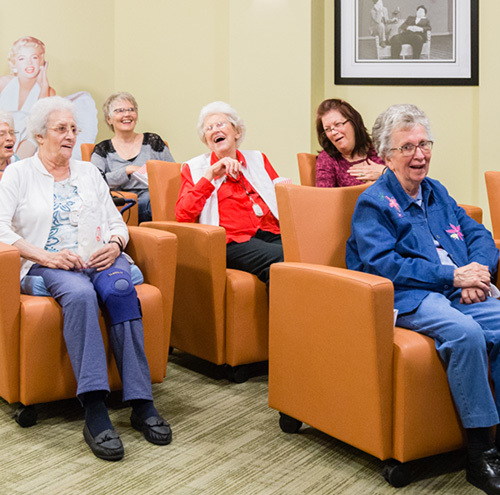 Situated in towns across Ohio, Danbury Senior Living brings you closer to everything you love and deserve. At Danbury, you’ll never feel isolated or alone. There’s no place like Danbury. Call Danbury home. After visiting many assisted living and memory care units in the Columbus area, we are extremely excited and grateful to have found Parkside Village. From the moment dad arrived, the incredibly compassionate, talented and dedicated staff have treated him like family. The staff’s infectiously positive attitude permeates every interaction in the building and creates a happy and loving living environment. High quality standards are the norm at Parkside Village and are evident in the assistance dad receives from the staff, the delicious meals served and in all communications with our family. We are blessed to have found the perfect home for dad.